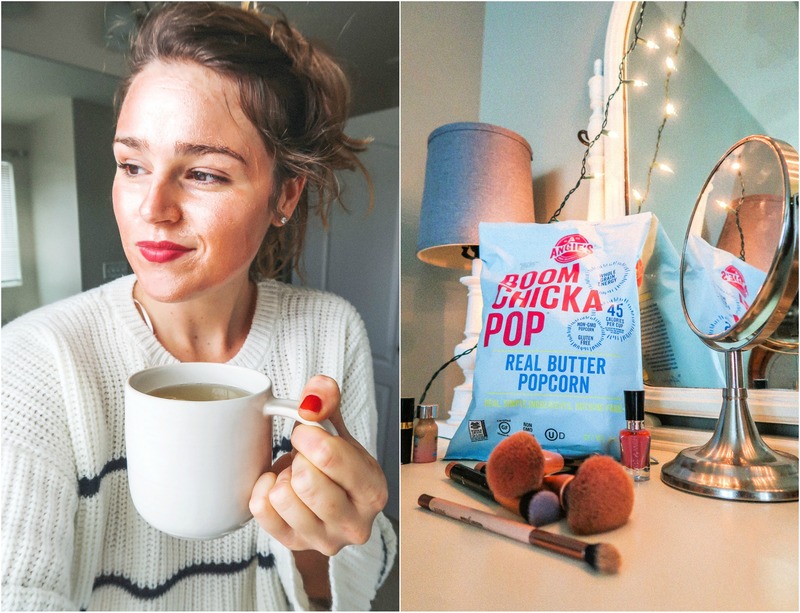 Today’s blog is sponsored by Angie’s BOOMCHICKAPOP & all opinions are my own! 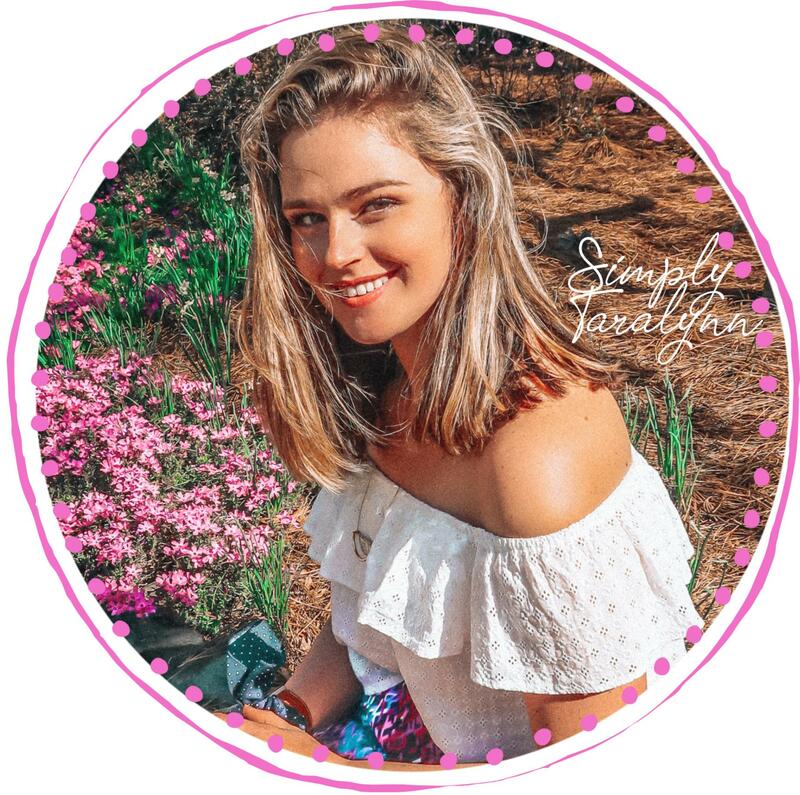 Thank you for supporting Simply Taralynn. Can you believe we have made it to 2019? Time is flying by. I have been complaining lately about time going by so fast, but my theory is that I’ve been consumed in all things technology, and all of these distractions are making my days a blur. 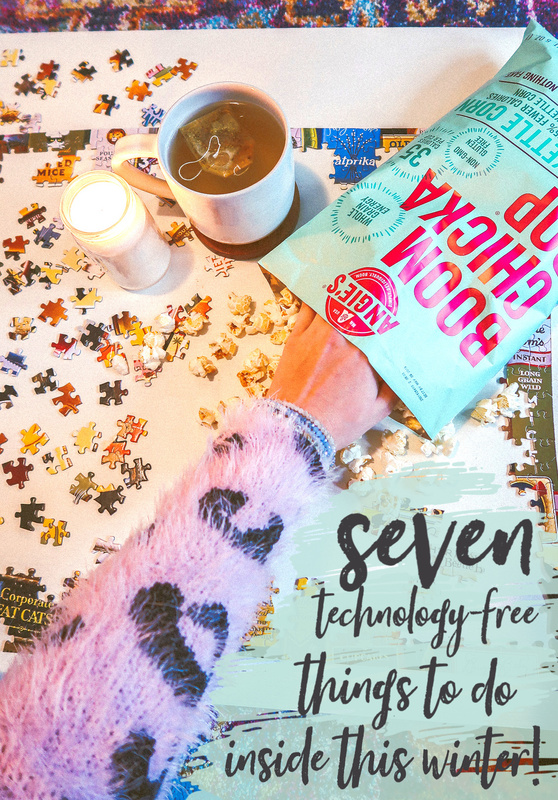 I’m excited to be partnering up with Angie’s BOOMCHICKAPOP today to share seven technology-free things you can do inside this winter! 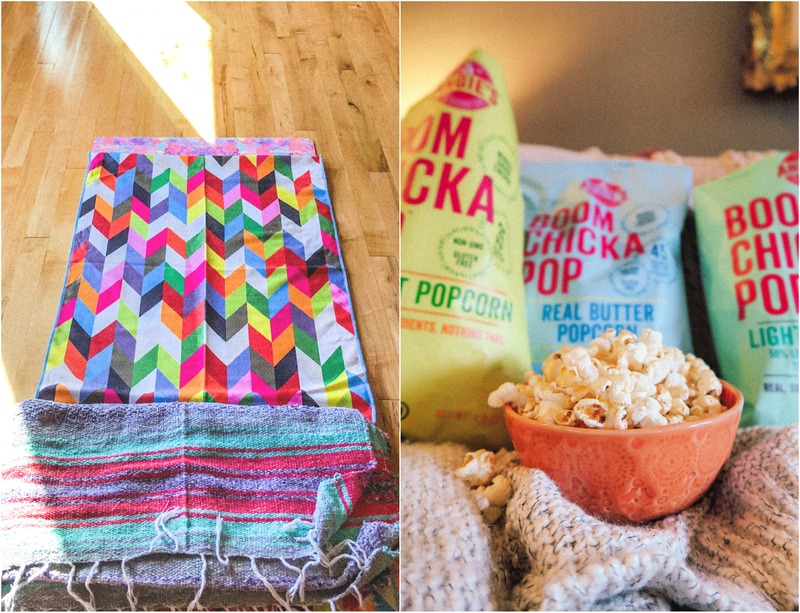 All of these indoor activities are more enjoyable with a bag of ready-to-eat popcorn! Angie’s BOOMCHICKAPOP bags are perfect for an everyday snack with flavorful whole grain popcorn made with simple ingredients. One of my goals for the new year is to take some timeouts from technology, even if it’s just for an hour or two. It’s healthy to let your mind wander without the distractions of social media, television, or music. I did a puzzle the other night without any music, TV, and my cell phone was all the way across the room. 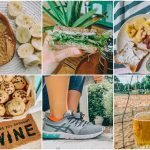 It felt like a vacation for my mind, and I started thinking about all of the things I wanted to do, what meals I wanted to make, and my brain was creating ideas without the help of a Pinterest board. I don’t think we give our minds a break it needs or the credit it deserves for being so powerful. I’m known for being a piddler when it comes to getting projects done around the house. I’ll dive into a new show or browse Instagram just to distract myself from completing projects. If I took a break from technology, maybe I’d finally declutter my closet, finish the touchup paint on my walls, or attempt to break down the boxes piling up in my garage. In the summer, I like to take my timeouts outdoors playing tennis or hiking a local trail with my dogs. Because it’s winter, I’ll be taking my timeouts inside! I usually watch a lot of T.V. or spend hours working on the computer, so it’s important to unplug and focus on being in the moment. I’d love to hear what you do to give your mind a rest during the winter. 1. 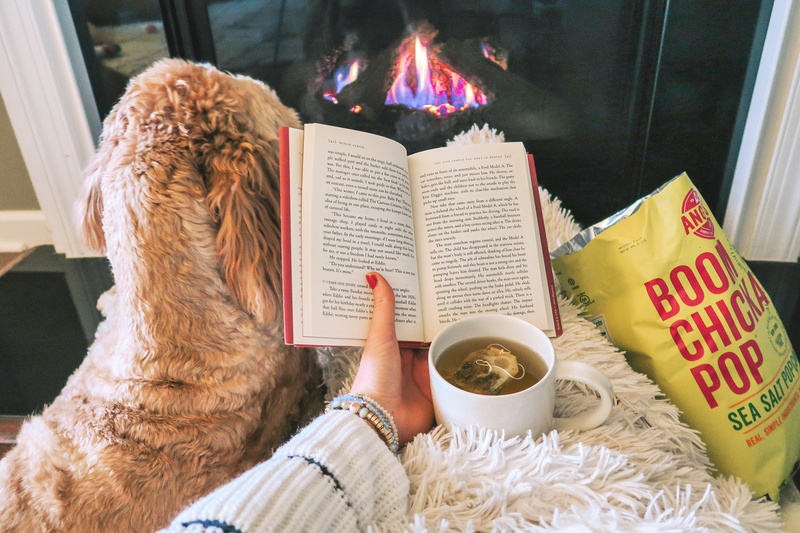 Read a book by the fireplace. I don’t know what it is about reading, but I get a sense of guilt with it. In the back of my mind, I feel like I should be finishing a blog post, or engaging on social media to grow my business, and that is not healthy. I love to read, and giving myself a few hours to unplug and reading is going to be a priority for me this year. I received some great books for Christmas and I can’ wait to dive right into them. I sat by the fireplace to stay warm with a hot cup of tea and dove right into a book. It felt nice to relax in a quiet house curled up next to my dogs. I enjoyed Angie’s BOOMCHICKAPOP Sea Salt Popcorn! It’s made with only three ingredients (popcorn, sunflower oil, sea salt) and extremely flavorful! I love that there is nothing fake hiding inside the bag. Each cup of the flavorful sea salt popcorn is 35 calories. 2. Try a recipe from a cookbook. When I’m cooking, I’ll sometimes scroll through my feed while waiting for water to boil, or sauce to simmer. I decided to ditch my phone and pull out a cookbook as a resource. Without my phone in the kitchen, I started cleaning out the fridge and wiping down the cabinets while waiting for the food to cook. It’s pretty crazy what you can accomplish without the distractions of technology hanging around. When I finished cooking, I wasn’t left with a giant mess because I cleaned up as I went instead of sitting on my phone. When I cook, I snack. The problem is that I wait until I’m super hungry to get up and cook, and I just need something to hold me over. Popcorn is almost always my go-to when I’m cooking on an empty stomach. It’s a good idea to leave Angie’s BOOMCHICKAPOP ready-to-eat bags in your pantry if you’re anything like me. I’ve always been a huge advocate for team “pampering yourself.” I believe every night should end with hot bubble baths, herbal tea, and your favorite facemask, which I’ve been loving the peel-off gold masks lately. Sometimes social media can be exhausting, and the best thing to do is leave it behind and give yourself a little self-care session. I always feel mentally refreshed and it sets myself up for a good night’s sleep afterward. Jumping into bed with fresh linens and fluffy pillows is one of the greatest feelings. Take some time to wash all of your bedding, and soak your makeup brushes. For some reason, I always do these two things on the same day. It’s become some strange routine, but I also like to check expiration dates on all of my bathroom products and makeup while my makeup brushes soak. There is nothing more satisfying than clean sheets and disinfected makeup brushes! 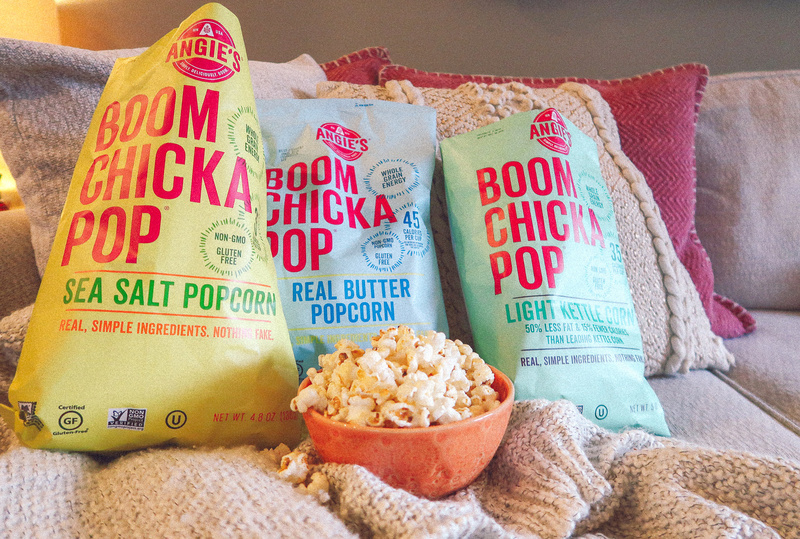 Angie’s BOOMCHICKAPOP popcorn is backed by the brand’s live out loud attitude, where fans are encouraged to “crush it.” Pampering myself and getting projects finished around the house are the small day in the life victories that make me feel like I am totally crushing it. 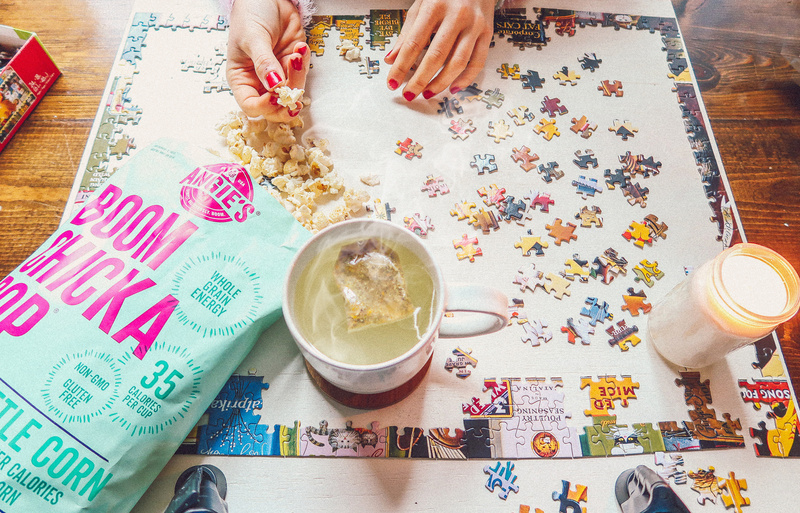 Puzzles are not just for kids. I have always loved putting puzzles together, and I don’t get to do it nearly enough! That’s all on me though; It’s like the book thing where I feel guilty about taking the time to do something that isn’t work or being active. Puzzles are a great way to put your mind to work and relax. Just don’t lose any puzzle pieces, because that’s the absolute worst. Light a candle, make some hot tea and enjoy a fun puzzle to escape the craziness of the internet or news. I enjoyed (LIKE REALLY ENJOYED) the Light Kettle Corn ready-to-eat flavored bag of popcorn! It reminded me of the sweet and salty kettle corn I used to get at the theme park as a kid. It had that same perfect crunch and sweet glazed texture. Each cup is 35 calories and made with real simple ingredients like popcorn, cane sugar, sunflower oil, and sea salt. The Real Butter flavor is also made with four simple ingredients such as popcorn, clarified butter, sunflower oil, and sea salt. Less clutter and organized messes are a great way to relieve some stress. If I spent less time on my computer and more time organizing closets and drawers, my life would be much easier to navigate. I have several closets and drawers I want to tackle this year. I’m looking forward to decluttering and spending more time on my organization skills. This is always put on the backburner, but not this year! I’m determined to make it a big focus of mine. And whenever I spend hours organizing and putting lots of energy into it, I get hungry! Popcorn is a great whole grain snack to help you get through the project. Because I’m doing a vegan January challenge, I love that the ready-to-eat sea salt and light kettle corn are vegan-friendly! 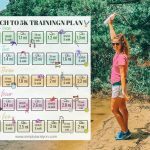 This helps me enjoy some delicious snacks while staying on top of this challenge. 7. Do some living room stretches. I love to lay out my yoga mat in the living room and do deep stretches for thirty-minutes every afternoon. It’s a great way stretch and relax while filling your body with good endorphins. I feel better after doing yoga in my living room than doing yoga in a crowded studio that I have to drive through traffic to get to. It fits my lifestyle better and sets myself up for a great day. And of course, after taking my timeout from technology, I’ll allow myself to grab a bowl of popcorn and dive onto the couch to catch up on work and watch one of my favorite T.V. shows. You can find Angie’s BOOMCHICKAPOP in almost all of your favorite stores; I even grab a bag when I’m at the airport. Head over to their website to check out more of their flavors, and use their store locator. Have you tried Angie’s BOOMCHICKAPOP yet? What do you do inside as a way to escape technology? LOVE Boom Chicka Pop! I actually brought their kettle corn bag over to my boyfriend’s parents’ house for a movie night last night and his mom was OBSESSED with them 😂Love these tips! Well, that’s a win for sure!!! 🙂 Hope you had so much fun!! I LOVE BoomChickaPop! It’s always my favorite go-to popcorn. My fave has to be the light kettle corn! That sounds like my kind of night!!! This post was SO what I needed to hear right now. I’m so guilty of coming home from work and sitting down on the couch with my phone. Next thing I know hours have gone by and I’ve accomplished nothing. Hate feeling like that, and this post was the push I needed to stop spending so much time on my phone! Question – what is the benefit of the blanket on top of your yoga mat? It looks so cozy but I feel like it would be moving around all the time? Same, Samantha!! It’s all just a big distraction. It actually helps with comfort when I’m doing stretches or poses laying on my stomach/back and when you roll it up, it’s perfect for posture! Have you tried cryptoquip puzzles? They have them in the Sunday paper. It’s where one letter stands for another and they only give you one clue. They’re pretty fun! Also, Speed is a fun card game to play with someone. Love their popcorn. Mix some m&m s or broken up Oreo pieces to make it an extra fun dessert treat! Never heard of that!! M&Ms and popcorn? YES YES YES!!! I agree with you 100% about bubble baths and face masks! My husband and I both cherish our alone time in the evening, so I appreciate your mention of the puzzle. 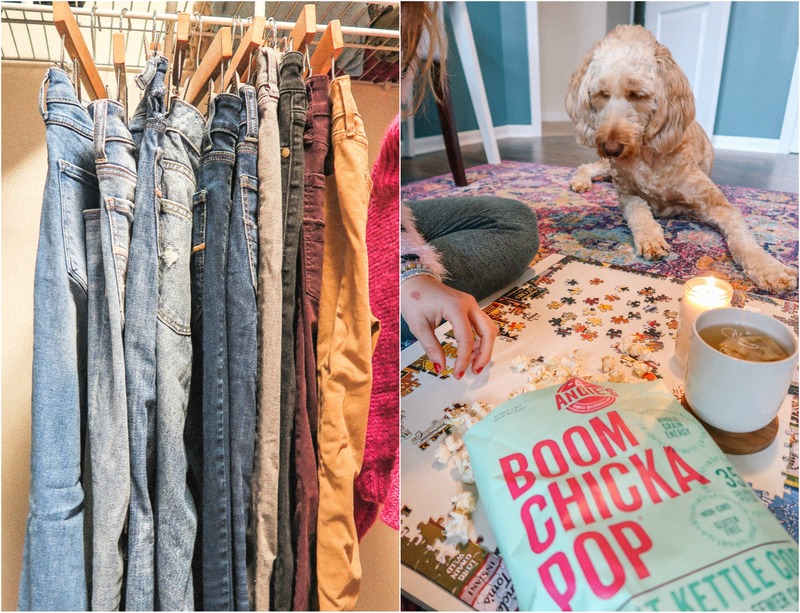 We used to do them a lot when we started dating, so we’ll have to try that again this weekend so we remember to make time for each other l. I also haven’t tried Boomchickapop, but it’s on my list for snack ideas (because you’ve gotta mix it up)! To unplug I love to organize, flip through a magazine in print, and read. 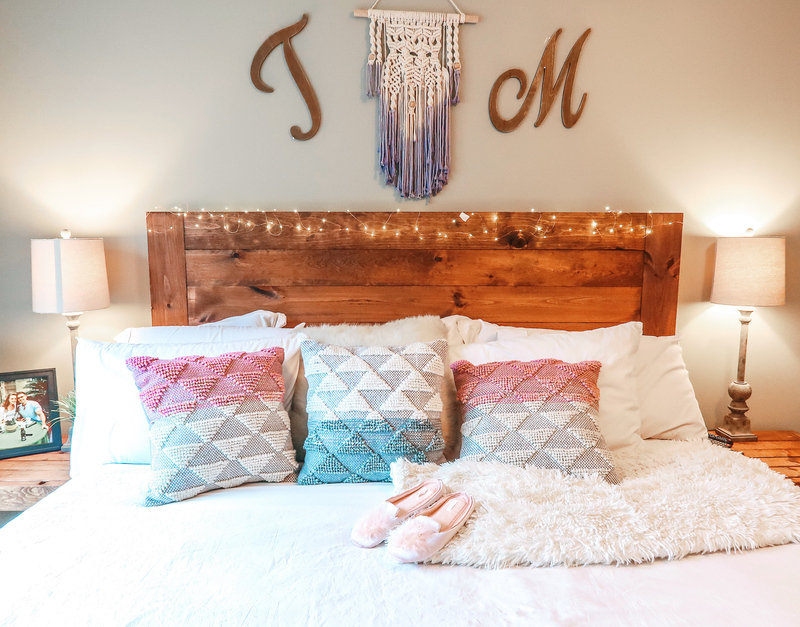 Fuzzy socks + hot tea + Elle Décor = winter relaxation at its finest. I also love planning. Spending 10 minutes each morning and evening with my planner helps me keep my head on straight. I have always been inconsistent with journaling, so I’d love to try that. Does blogging help you process and unwind like a paper journal would? I found your first blog about 6 or 7 years ago. Thank you for sharing your journey, your great recipes and exercise tips, and most of all your resilience! Your posts have reminded me on more than one occasion that healthy living is a lifelong endeavor. I love organizing and sitting by the fireplace with a good book. I haven’t tried this popcorn but I’ll swing by Target to pick some up later this evening. I love your blog, Taralynn! You’ll have to let me know what you think of the popcorn! I like to sew or crochet, but I don’t do either very much. Feels so good when I do though! I’ve recently started to Sudoku puzzles in place of being on my phone. I feel like that’s a step in the right direction. I LOVE to read, but I get the same weird guilt feeling too. Like surely there’s something more productive I could be doing. I’m so bad at Sudoku! lol But it’s a great way to escape from the phone!! Love this!! Such great ideas!! Personally I like to declutter/organize. Sometimes my husband and I will play a card game..like War.. I almost always win 😉 haha! Thanks for sharing more ideas. I still need to try that pop corn!!! Yes, organizing and decluttering is my jam! War used to be my favorite! Kyle and I sometimes do Egyptian ratscrew. No I have not tried this popcorn but will def look for it. Read, read and read is the best. Also yoga is a great release as well. Isn’t hard though to sit in silence sometimes? I almost always have either the TV or radio on, even for background noise. At times it is nice to sit in silence. You just reminded that I love doing puzzles as well, I plan on getting one this week, thanks! I try to work in silence without T.V. and that’s easy but sitting in silence and listening to thoughts sounds very hard! Even in the car, the radio has to be playing. Stop at Target and get a puzzle and popcorn for the weekend! 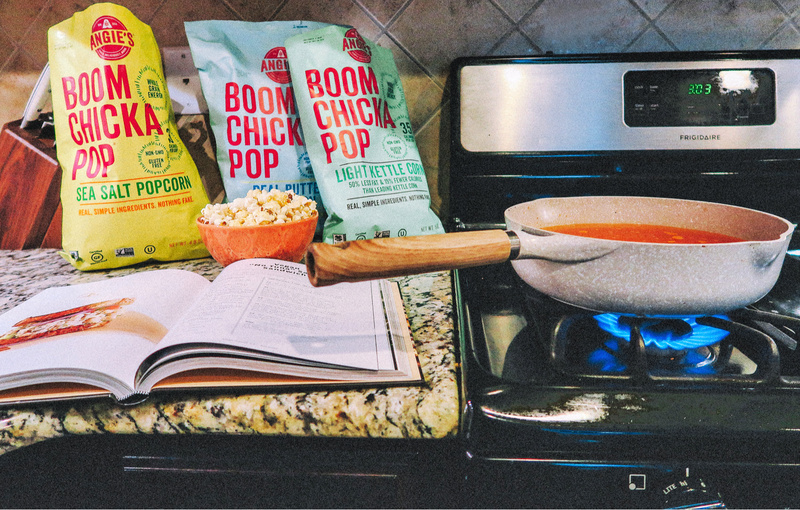 I don’t think I’ve tried the BOOMCHICKAPOP yet, but I love Kettle Corn so I’ll have to try it soon. I’m not really allowed to eat popcorn because I have braces but I just found out yesterday that I get my braces off in 47 days! I can’t wait, especially since I’ve had them on for almost 4 years. To escape technology inside i either read, do a face mask or just play with my fur-babies. Outside, I swim, take walks, go to the gym, etc. What?! Goodness, you must! It’s amazing. Love all of those activities! 1. Have you tried Angie’s BOOMCHICKAPOP yet? 2. What do you do inside as a way to escape technology? I make time to play with my cats each night. One of them is 15 years old and is still soooo energetic. When I’m on my phone and she’s staring at me waiting for attention, I feel so guilty! They won’t be around forever and I want them to feel like they’re more important than some tech device. Right now, I’m reading The Five People You Meet in Heaven, which was from Kyle’s mom and she sent me the follow-up book! I need to keep these at work with me! I’m a teacher and always get hungry when the kiddos leave but have to stick around for a couple extra hours. I think these bags would make a great snack to hold me over until dinner. MY FAVORITE POPCORN! My husband and I can do serious damage with the butter flavor. I don’t go completely tech-free, but I like to take a break from social media by diving into my favorite movies! I think watching movies and taking a break from social media is just as good! When Kyle and I watch movies, we make sure our phones are on the counter! Colorful DIY Pom Pom Wreath to Brighten Up Your Door!